In 2017, at the first Protect Wisconsin Waterways Sweep, we had three clean-up locations and 30 volunteers helping clean up the Rock River and connected waterways. Last year in 2018, it grew to six locations and 130 volunteers! 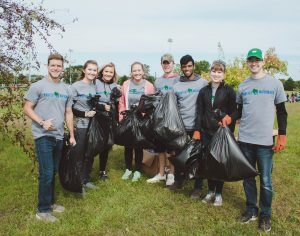 From picking up basic trash like aluminum cans and wrappers to more unique items – bike tires, plastic toys, shoes, a TV, and a parks and recreation barrier – volunteers have fun while making a huge splash in the environment and community! So how do we plan to make more of an impact in 2019? With eight clean-up locations this year, Protect Wisconsin Waterways plans to make this the biggest and most impactful Sweep yet! These locations will be in the Rock River Stormwater Group member communities of the City of Beloit, Town of Beloit, Janesville, Milton, Whitewater, Fort Atkinson, Beaver Dam, and Waupun. Check back soon for more information on times and locations! Looking to Volunteer & Clean up our waterways? Interested in volunteering? For more information or to receive updates on the 2019 event schedule in your community, fill out the volunteer form on this page or send us an email protectwiwaterways@gmail.com. Remember to register early to receive a free event t-shirt at the Sweep!